Stanford Advanced Materials (SAM) supplies high quality sodium aluminum fluoride (Na3AlF6, cryolite) with most competitive price. 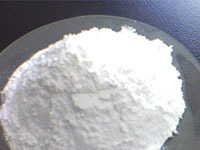 Other fluorides: Sodium Fluoride (NaF), Aluminium Fluoride (AlF3), Magnesium Fluoride (MgF2), etc. Sodium Aluminum Fluoride (Na3AlF6), also called cryolite or sodium hexafluoroaluminate, is a colorless, glassy prismatic monoclinic crystal with Mohs hardness of 2.5 to 3.